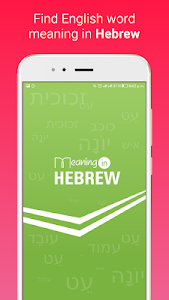 Meaning in Hebrew is a quick app in which you can learn English words with Hebrew as well as English meanings available for all words. Meaning of words is provided with definition, synonyms, and antonyms in Hebrew. Searching words through voice, the pronunciation in English, detecting typed language automatically will make your life easy. One can listen to the pronunciation of Hebrew and English words to read and speak words properly using Hebrew English Dictionary. A lightweight android dictionary application works offline and gives faster results without any hassle. 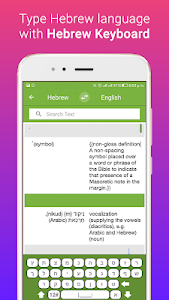 This free Hebrew English Dictionary app is very helpful for pronunciation and spelling learning tool and it also has one powerful dictionary to translate sentences from Hebrew to English and English to Hebrew. Thesaurus helps to keep in mind the ease of use of an app, this feature is included in English to Hebrew Dictionary or Hebrew to English Dictionary, so that user may select any of the alphabets from the list and words starting from that particular alphabet will be displayed in list form. Auto word search option enlists all the related words as a suggestion which user is looking for i.e. quick access to words assisting users to search their desirable words in on time. 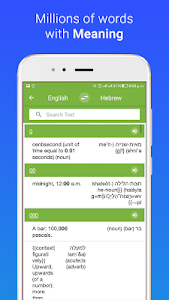 ● Learn Hebrew and English language quickly with this app. ● Reliable and free dictionary app used by many users for their daily translation need. This is not only a Dictionary but also a vocabulary and learning tool. 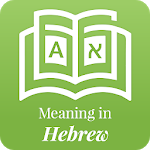 This Meaning in Hebrew is also the best reference guide amongst school apps for kids. Download this Hebrew English Dictionary app today and start learning English. Help us to make this free dictionary as the popular and best-rated app book for Hebrew translation to English by sharing it with your friends and family. Similar to "Meaning in Hebrew"
Ribaz English – Kurdish Dict.